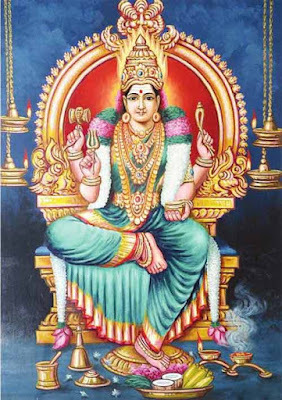 Varusha Pirappu, the Tamil New Year day, observed in the month of Chithirai is observed or celebrated mainly by viewing ‘Kanni,’ reading or listening to Tamil Panchangam (New Year Predictions) and by eating the naivedya neem leaf pachadi. The list of what to do on Tamil New Year day varies from region to region and from community to community. Below is a brief idea on how to observe Tamil New Year. Note - Kanni is optional as it is not followed by all Tamil Hindu communities. For Kanni – viewing of auspicious things in the morning of New Year – Gold, silver, jewelry, mirror, new clothes, new calendar, bananas, arecanut, betel leaves, raw rice, coconuts, fruits, vegetables and other newly harvested farm products. To Begin - What to do on Tamil New Year? House is thoroughly cleaned and doors and windows are decorated with festoons – especially leaves of mango. After bathing, the eldest female member in the family starts the Puja arrangement. Kolam or Rangoli is drawn; the Vilakku kolam is the preferred one during the New Year. This rice-flour kolam is an essential aspect of Tamil New Year. If new clothes are distributed to family members, then it is arranged in front of the deity. Neem leaf Pachadi is prepared. It is basically a mixture of jaggery, chillies, salt, neem leaf or flowers and tamarind. It symbolizes that life is a mixture of sweet and sour. In places where Kanni is viewed, an elderly member guides others to the view the arrangement of auspicious things. This arrangement is usually done on the previous night. In other places, all members wake up and take bath and receive new clothes. The Puja - How to Observe Tamil Puthandu? The most important puja on the day is the Panchanga Puja. Some people also perform the Navagraha Pooja. For Panchanga Puja, the latest Panchangam is placed in front of the deity in the Puja room. It is then anointed with chandan (sandalwood paste), kumkum and turmeric paste. Some flowers are placed on the panchanga. A simple puja and aarti is performed for the deity. The neem leaf pachadi is eaten on empty stomach. People then wish friends and relatives – puthandu vazthukal. After the Pooja, the Panchangam is read especially the predictions for the next year. People who do not perform the Panchangam puja perform a simple puja. Some people prefer to listen to the Panchanga padanam held in temples. The menu for the day usually consists of food made from fresh vegetables. Green banana and jack fruit preparations are a must in many families. Sweet includes any one or two variety of payasam. Some families perform tharpanam (remembering the dead ancestors and other rituals) on the day.